Learn to make Rajasthani Tomato Mustard Garlic Chutney | Rajasthani Tamatar Ki Chutney recipe with step-by-step photo instructions. Tomato Mustard Garlic Chutney is an authentic dish from Rajasthan. A piquant, sweet, tangy and spicy chutney. It has the burst of flavors and colors like the state itself. It was all bright and shiny yesterday! However, it’s not bright anymore. It’s raining today! But let’s keep our spirits high and hope that the days would be warm and sunny again. For me, this shiny bright day demanded for some bright and vibrant food. I asked myself, “How about some old authentic food?” And the answer was YES! So it was a day to savour some old fashioned food. Can you believe it? But that’s true. Nothing fancy, just a plain simple meal. This sounds Chutneylicious — at least to me. The chutney I am sharing today is the one I love most. Seriously, I have loved this chutney all my life, and I still love it. The name of this chutney is ‘Rajasthani Tomato Mustard Garlic Chutney’. Now the question is, how did I learn to make this authentic chutney? Well, I learnt to make this chutney from my Granny. Actually, I just watched her cooking this chutney a thousand times. So this is one of those traditional recipes which are passed down to generations. This chutney was an absolute favourite in my house. And that’s why it was a frequent visitor too! My Granny used to serve this pungent chutney along with some hot stuffed parathas. My version of Rajasthani tomato chutney would attract a wider audience. You can easily say that this delicious and intriguing tomato chutney is the quintessence of handy food accompaniments. This comes with the just the right amount of tang and spices you need. I think this chutney should get an award for an exemplary blend of spices and tomatoes. No kidding! This is one of those quickest, simplest and easiest recipes, which does not include a long ingredient list. It’s super simple and only requires some fresh red tomatoes, along with onion, garlic, few spices and most important mustard seeds. See, a few simple and handy ingredients would make this chutney luscious. This is effortless, quick and full of tomato goodness. That’s it. I would rather say it’s a cakewalk! To tell you the truth, I am a HUGE fan of chutneys. And this one is close to my heart, so I had to share this one for sure! OH! I am just so fond of this authentic Rajasthani Tomato Chutney. This chutney has the capability to lift up the flavors of sandwiches, burgers and wraps. It can even compliment the sausages and wedges. Sometimes the simple food is the best. This chutney is my all time favorite among the simple foods. And this is also a perfect dish to make on those occupied days when you are damn busy. Generally, I keep this chutney in my refrigerator. I simply spread this chutney on the regular bread whenever I feel like savoring this tangy goodness. YUM! Addition of brown sugar to this chutney is my personal favorite, so I have added brown sugar. But you can use regular sugar, honey or whatever sweetener you prefer. This chutney would not come out perfect without any sweetener, so this a MUST. This is sweet, a bit sour-tangy, and full of deliciousness. And it would surely add a zing to your regular boring meal. A perfect dip for those spicy lip-smacking snacks. Traditionally, this chutney of sweet and sour tomatoes is served with dal bati churma or parathas. Try out this pucker-worthy chutney. You will love it! Let’s learn to make Rajasthani Tomato Mustard Garlic Chutney recipe with step-by-step photos. Heat oil in a heavy bottom pan. Add the mustard seeds. When they start to crackle, add chopped garlic and onions and saute for 3-4 minutes. Now add tomatoes and cook for about 1 minute. Add red chili powder, coriander powder, garam masala powder, turmeric powder, salt, and sugar. Mix well, and let it cook on low heat for about 15-20 minutes. Stir occasionally to prevent chutney sticking to the bottom. Remove from heat, when the chutney pulpy and soft. Let it cool completely. Transfer into an airtight glass jar. Refrigerate and uses up to 3-5 days. 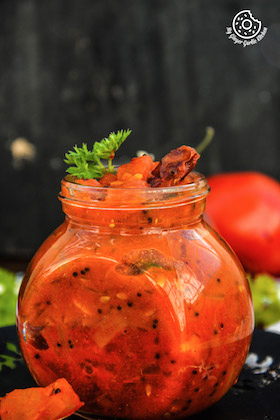 Rajasthani Tomato Mustard Garlic Chutney is an authentic dish from Rajasthan. A piquant, sweet, tangy and spicy chutney. It has the burst of flavors and colors like the state itself. 1. Heat oil in a heavy bottom pan. Add the mustard seeds to it. 2. When they start to crackle, add dried red chili, chopped garlic, and onions. Saute for 3-4 minutes. 3. Now add tomatoes and cook for about 1-2 minutes. 4. Add red chili powder, coriander powder, garam masala powder, turmeric powder, salt, and sugar. Mix well, and let it cook on low heat for about 15-20 minutes. 5. Stir occasionally to prevent chutney sticking to the bottom. Remove from heat, when the chutney pulpy and soft. 6. Let it cool completely and transfer to an airtight glass jar. 7. Refrigerate and uses up to 3-5 days. 1. You can replace brown sugar with the same amount of white sugar, maple syrup, honey, or jaggery.